Designers at Gensler relied on Kinateder Masonry and WI ADC members to handle this intricate open-jointed rain screen wall design for Johnson Controls headquarters in Glendale, WI. 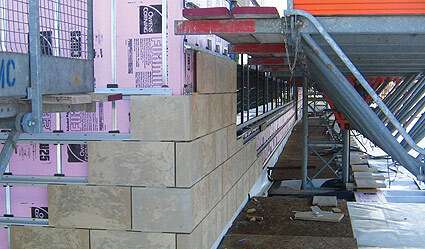 The wall features thick stone, custom anchoring and insulation, and water/air/vapor barriers. To capture work in the growing market of high-performing, sustainable buildings, IMI is positioning BAC members and contractors as experts in the complete building envelope. The envelope lies at the heart of building performance, with responsibility for the critical functions of controlling moisture, air flow, vapor and heat transfer. The BAC/IMI New Products Initiative helps contractors bid new products, like the Arriscraft ARRIS•clip thin stone rain screen wall system used for Virtua Hospital in Voorhees, NJ. IMI worked with the architect and held a special training session for members of Local 5 NJ and Local 1 PA/DE who were on the job. BAC contractors have several more ARRIS•clip projects in the state now. Solving those challenges means keeping on top of the best products and systems. One of the most popular building envelope solutions today is rain screen walls, which appeal to designers and building owners for both looks and performance. Masonry rain screen walls take many forms, from simple cavity or ventilated walls to open-jointed, or pressure-equalized, cladding systems that let air flow into the wall but not into the building. The cladding (and even re-cladding) options for rain screen walls include ceramic tile, terra cotta, brick, calcium silicate and stone. Members of the WI ADC working for Kinateder Masonry installed terra cotta masonry rain screen walls on two of the four buildings of Kerry America’s corporate headquarters in Beloit, WI. 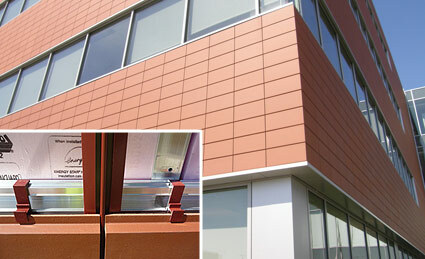 Their collaboration earned the BAC Craft Award for Best New Masonry System. To help target audiences appreciate BAC expertise, IMI has partnered with rain screen wall manufacturers to deliver custom training to BAC craftworkers, and has begun educating contractors so they can get comfortable bidding and using the new systems. to make BAC the obvious choice.